Silverton Gallery: Located next to the Village Office in our Municipal Block, the Gallery was originally built as a Schoolhouse in the early 1900s. It now houses an art gallery; performance room with theatre lights & sound system; workshops; dressing rooms; and a kitchen. The Gallery operates year-round, thanks to a host of volunteers and a small paid staff during the summer months. For more information please check out their website! 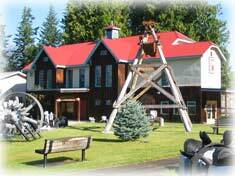 Historical Interpretive Centre, Fingland Cabin and Outdoor Mining Museum: Silverton is proud of its history and heritage. It has an active Historical Society which runs these three facilities. The Interpretive Centre is housed in the Silverton Gallery building; the Outdoor Mining Museum is located in front of the Gallery; and Fingland Cabin is across the street. 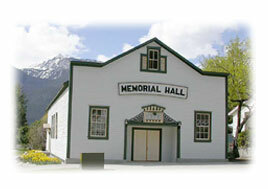 Memorial Hall: Our grand dame community hall was built in 1919 through a combination of public subscription, donations and volunteer labour. Memorial Hall, recently underwent major renovations and now features a new fully equipped kitchen, lighting system, full sound system, LCD projector, 200 " screen, satellite TV and full Internet connectivity. It is one of the finest acoustic halls of its size in Canada, and is ideal for concerts, meetings, receptions, dances, weddings, etc. Fire Hall Meeting Room: Can accommodate groups up to 24 people, with a small kitchen and board tables. Conveniently located in the Municipal Block, it is available for rental through the Village Office. Silverton is a wonderful place to get away from it all, or to host a seminar, business retreat or workshop. Please contact the Village Office for more information or for assistance.